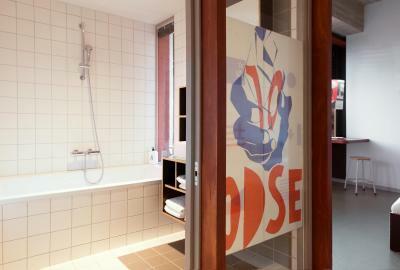 Lock in a great price for Volkshotel – rated 8.8 by recent guests! 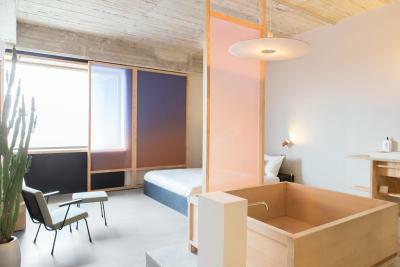 It is a nice hotel, it's trying to be uber cool type of hotel. Staff were friendly, and music was good. The beds were horribly uncomfortable but that has been my experience in all of Europe. I guess I am just a spoiled American. Everything else was totally amazing and would highly recommend this hotel. Quirky hotel with great atmosphere. The staff were extremely friendly and helpful and taught us how to imbibe Jenever correctly. Good transport links eg Metro outside and tram to museums a couple of blocks away. the spa rooftop is just amazing. 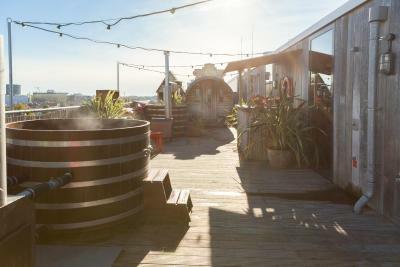 Such a great view over Amsterdam that you can enjoy while sitting in a hot tub! it is a great choice for a short stay in a good location. The food menu was good in the bar , and reasonably priced. The ground floor bar was cool and alternative, with good music by did in the evening night. There's a downstairs nightclub and and any the upstairs bar which are open till 6am. So it's great for young groups. Only 10 mins on the metro or less to the centre. There's also hot tubs on the rooftop of the hotel! 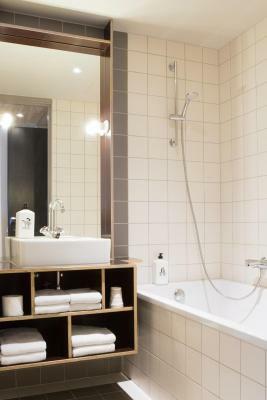 - 3 stops away from central station - Good facilities in the hotel (sauna, jacuzzi, bar, board games, coffee place) - Very well decorated, good atmosphere - good breakfast. Relaxed, comfortable and no fuss. Will stay again. 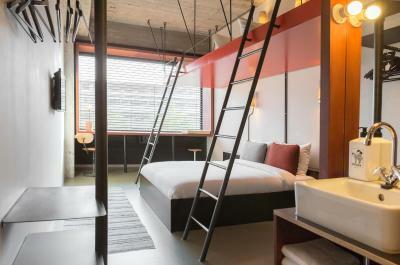 Volkshotel is located in the East district of Amsterdam, only 150 feet from metro station Wibautstraat. It offers a vibrant lobby café, a nightly cocktail bar, work places, meeting rooms and a creative hub that includes studios for designers and music producers. 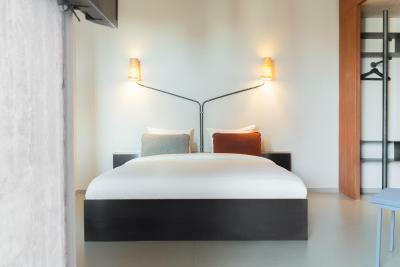 The 7th floor features a restaurant/club with 360º view over Amsterdam, which hosts parties on Fridays and Saturdays. Guests benefit from free WiFi. The river Amstel is a 2-minute walk from the Volkshotel, while Oosterpark is 2,800 feet away. A variety of bars and restaurants can also be found there. 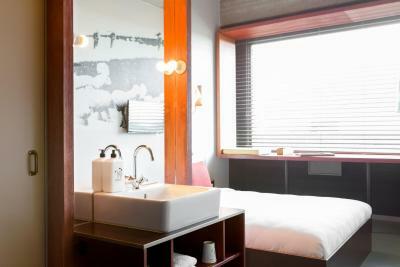 The hotel is 0.8 mi from De Pijp, 1.4 mi from Rembrandtplein and 1.7 mi from the museum quarter. 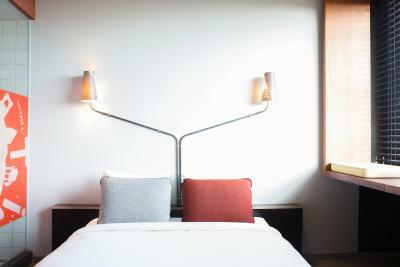 When would you like to stay at Volkshotel? 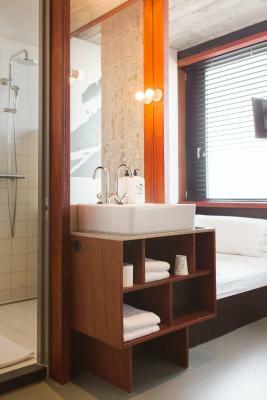 This small minimalistic room features a queensize bed, coat hangers, free high speed wifi and a private bathroom with shower. There’s a concrete floor and a concrete pillar next to the bed. The large window can be blinded by shutters and there is a smaller window for ventilation. This minimalistic Double Room features a queensize bed, coat hangers, free high speed wifi and a private bathroom with shower. 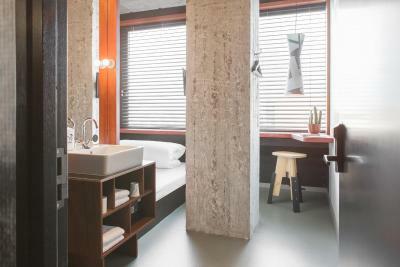 All rooms have a concrete floor. The large window can be blinded by shutters and there is a smaller window for ventilation. This minimalistic Quadruple Room features 1 queensize and 2 single beds, coat hangers, free high speed wifi and a private bathroom with shower. The large window can be blinded by shutters and there is a smaller window for ventilation. This minimalistic Quadruple Room features 1 queensize and 2 single beds, coat hangers, free high speed wifi and a private bathroom with bath. The large window can be blinded by shutters and there is a smaller window for ventilation. Volkshotel is a lively place, where locals and travellers work, meet, drink, eat and dance together. 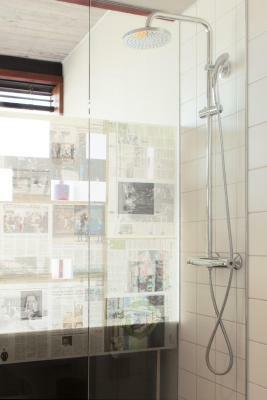 Volkshotel is located in a former newspaper office. The interior designers incorporated the original elements of this 1960’s building: glass, concrete and wood. 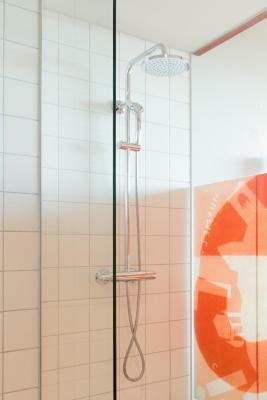 House Rules Volkshotel takes special requests – add in the next step! ATM card Volkshotel accepts these cards and reserves the right to temporarily hold an amount prior to arrival. Volkshotel accepts these cards and reserves the right to temporarily hold an amount prior to arrival. If you arrive before 16:00 hours, you can leave your luggage at the reception. An additional entrance fee to club Canvas may be required, depending on the evening. On Friday and Saturday night there is music from 22:00 until 04:00 in Club Canvas. An additional entrance fee to Club Canvas may be required, depending on the evening. Please note that it is recommendable to make a reservation for the restaurant. 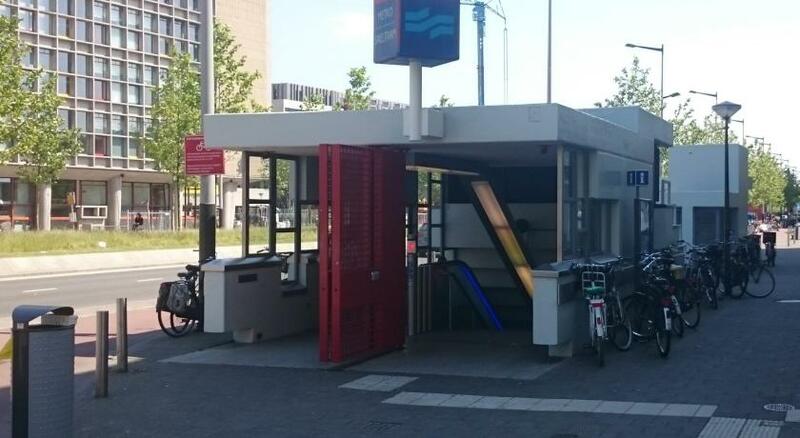 Perfect location just by the metro, only 5 stops from Centraal station, great facilities and restaurant, superfriendly and helpful staff. Amazing decor! This hotel is very overpriced, you can get much better rooms for these amounts. They stripped the building to get the much desired concrete industrial look which is cool but they forgot to soundproof the facade. Since the hotel is on one of the busiest- all night long traffic - streets it was very noisy. The dressing room for the hot tubs and sauna smelled of beer and urine, we didn't go to use these facilities. The restaurant has simple but healthy food and great views. The lightning in the room could be bright. The Hospitality of reception was wonderful. The lady in the reception helped to get extra kid bed personally and ensured the comfort. The security system of room access very good. The location is near to super market and Metro station. Over all we as family enjoyed the stay. Somehow there was poor lighting in the room , but that was a very minor thing. 2-3 metro stops away from City center or 20 min of walking and with the price of the room , it is definitely worth it. Quirkiness! Room quite unique from any I have stayed in before for a city break, ideal for a family with teenagers😁, usually they would have to share a sofabed so the upstairs bunk was very well received. Felt like we were among locals and the staff were fabulous, especially our waiter in the restaurant. We stayed in one of the special rooms and it was an exciting and unique experience. 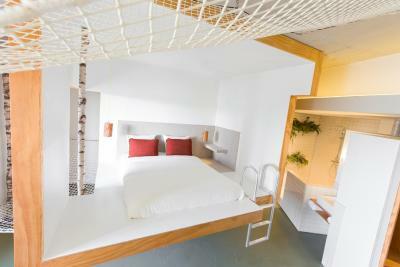 The staff were friendly and accommodating, and the location was perfect! I prefer rug in the rooms, small point. The hotel was excellent, the staff was very responsive and helpful.